At Museum Tinguely, Zilvinas Kempinas has been given ‘carte blanche’ to realize his biggest solo exhibition so far. On approximately 1500 square meters, it is spread across four exhibition floors and consists of both newly designed works and works that have already been on show elsewhere but are constantly re-created in each specific new space. 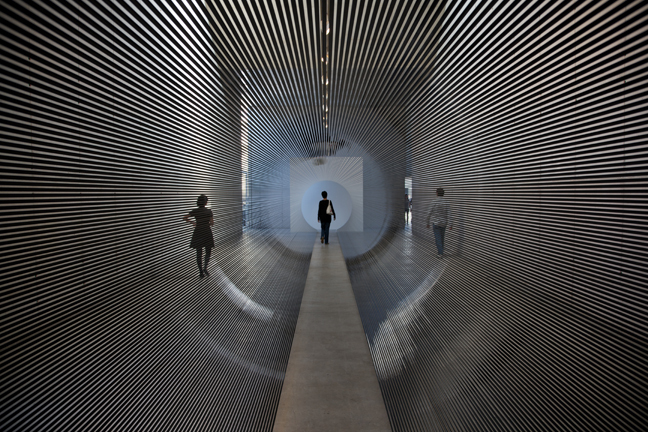 The visitor is ushered in by the work Light Pillars (2013), two large, eight meter-tall, freestanding cylinders. 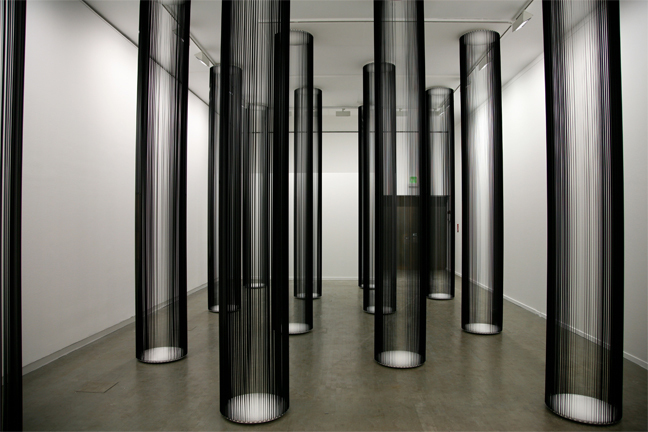 They are formed by several concentric layers of videotape, which are set in oscillating motion by fans and conceal light that shines up brightly from inside the cylinders. It is an extroverted work that demands every bit of attention, unfolding, amidst Tinguely’s big mechanical sculptures in the open hall, its own, powerful dynamic. However, Kempinas’s vocabulary also knows quiet contemplation, as we encounter it right alongside on about 200 square meters with the work Parallels (2007). Here, the videotapes hung in parallel up and down the length of the room enable the view both from above, from the gallery, and from below, in the room itself, onto this apparent ‘water surface’. One of the Museum’s most attractive spatial passages, the so-called ‘Barca’, the open access corridor from the ground floor to the gallery floor with a strip of windows towards the Rhine, is used by Kempinas for the work Timeline (2013): tapes hung vertically and in parallel redirect the gaze to the outside. 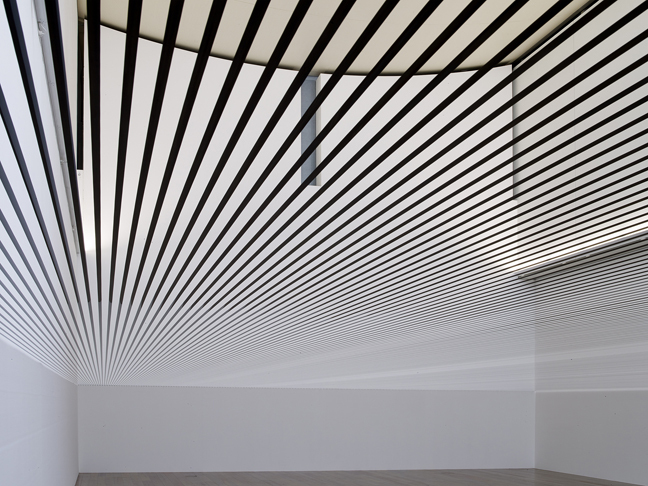 Whereas, when viewed frontally, the material of the tapes disappears and enables the view of the Rhine, the strip of windows apparently closes as soon as the gaze wanders into the diagonal or/and forwards or backwards. Then one experiences a rich play of refractions and reflections, which emerge on the now matt, now shining-dark surface. 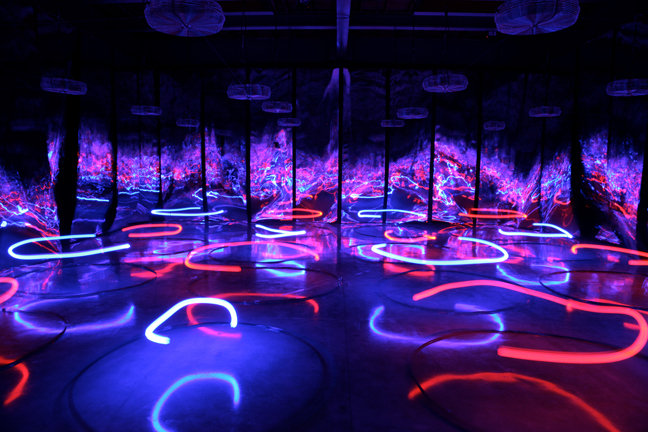 Kempinas stages a manifestation of energy to stun the senses in the installation Ballroom (2010) in the basement, where fans, colorful light bulbs, videotapes and mirror foil are united in a dense dance of the elements. It is a type of ‘light space modulator’, in which beholders can lose their way. Zilvinas Kempinas is a magician of the elements who combines the natural and the artificial as an engineer and Orphic. The contrast between facture and effect is already impressive in his early work Moon Sketch (2005). Out of the most basic materials, a cardboard tube painted black inside, adhesive tape and a 35 mm slide frame, is created an instrument for observing the sky which, though, functions as a periscope: when it is affixed only millimeters away from a wall and facing it, the crater-pocked moon apparently emerges on the dark firmament in the pale light. In actual fact we are looking at a piece of wall of just approx. 10 centimeters diameter which, with its texture, white wall paint, and the special lighting situation, enables this illusion in the first place. Nothing is hidden, everything is visible, and yet the effect leads us to a place that questions and challenges our visual habits.